I’ve never really been a huge fan of white in the past, but this bomber has really turned me on to the benefits of white. For those of us with darker skin, it can really highlight and accentuate our beautiful skin tones – it also gives space for my new hair colour to shine through and take centre stage. I’ve been stalking the White Dirt website for quite some time now as I am tending to verge towards independent labels lately, I’m not sure what the general feeling is, but I can’t help but think the High Street has started to get a little boring again of late, and for Independents, there are much less rules and more room for creativity with their designs. One thing I was pleasantly surprised by is just how luxurious the bomber actually feels, it’s so decadent! I’ve had fur coats in the past from the likes of Topshop and Miss Selfridge that didn’t ever feel that way, whereas this one feels like the faux-fur equivalent of Champagne & Caviar and doesn’t give that itchy feeling. Your hair is amazing! I love the outfit, however I am not brave enough to wear white - way to accident prone! Wow I love youy fur jacket! You look beautiful! Gorgeous outfit and I love your hair! I think you definitely should start wearing white more often. This reminds me of Marilyn Monroe - you look so beautiful. I'm obsessed with faux fur at the moment. So many beautiful colours at the moment! You can pull of just about everything! I'd never heard of White Dirt before but just had a nosey at their site and fell in love! Yes I have been noticing the layout change *thumbs up* and the hair really looks gorgeous against the white. 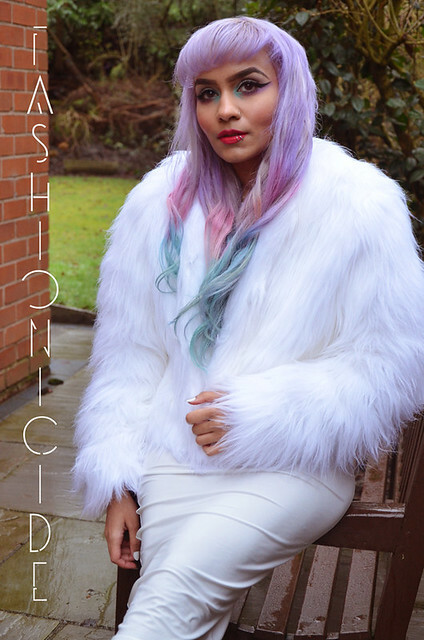 This faux fur is amaze. I didn't know White Dirt had been following me for quite a while - I need to pay more attention to companies lol. Stunning OTOD as usual. Was your bum cold on the bench arm lol? I JUST WANNA STEAL YO' HAIR. You are like the pastel princess! I am loving this whole white on white look, so very you!